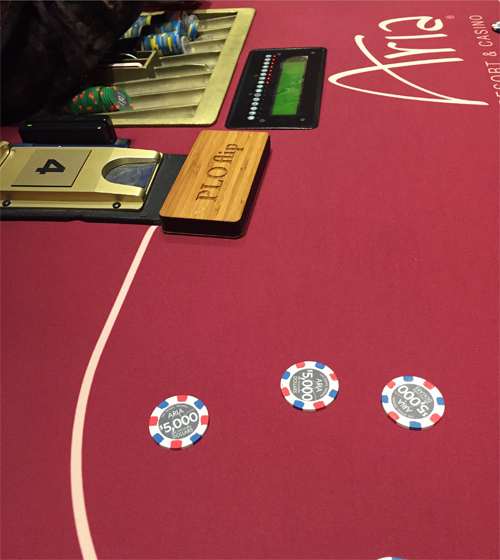 Yes, you are reading that correctly, the plaque says, "PLO Flips!" This is actually in the mix of games and is quite simply a game that requires zero skill. Everyone throws $10k into the pot and gets four cards. The dealer runs out a full board and the best hand takes the cake. It's just the one hand, UNLESS someone in the game pays $1000 to do an additional flip. In this case, everyone but that player would have positive equity to take on this gamble. It's pretty fun and overall I think it was good for the game. The blind structure and antes for each game was different since some games play bigger than others. The base blind structure was $300-$600 blinds with $600 in antes in the middle in a 7 Handed game. I brought half a million to the game, but chose to put the minimum buy in of $100,000 on the table. I thoroughly enjoyed playing this unique format. I've played a lot of 2-7 triple draw, for example, but always with a limit structure. 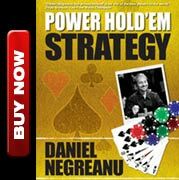 Early on I realized that I would need to make significant adjustments to my strategy playing the game pot limit. I enjoyed having to think about new things that I've never faced before. Early on in a hand of no limit 2-7 single draw I was lucky enough to get dealt 23469 on the button and raised to $4000. The small blind made it $13,000, and I decided to re-raise to $30,000. He called and drew one. After his draw, he put me all in for about $60,000 which is all I had left on the table, I called and won the pot as he made a 9-7. From there I was cruising and up a little over $300,000 after just a couple hours. As one player quit, another joined us and killed my mojo! He beat me every pot I played against him and put a big dent into my profits. Mostly by having the better hand, but also by playing his hands well and getting a little lucky to boot. One fun PLO hand against him I will share with you. The button blind raised and I called from the small blind with Jc Th 7c 2h. The big blind called as well. The flop Came Qh 8c 5c and I checked. The big blind bet $5000, the button called, and I decided to peel really hoping to catch a 9. The turn was the Ace of hearts giving me an open ended straight draw (K or a 9 for the nuts straight) as well as another flush draw. I thought about betting here, and in hindsight I think it may have been a better play, but I decided to check. The big blind now bet $20,000, the button folded, and I called. The river brought the Jack of spades. A total brick to my hand but it looks like a card that easily could have helped me if I was holding either 9-10 or K-10. 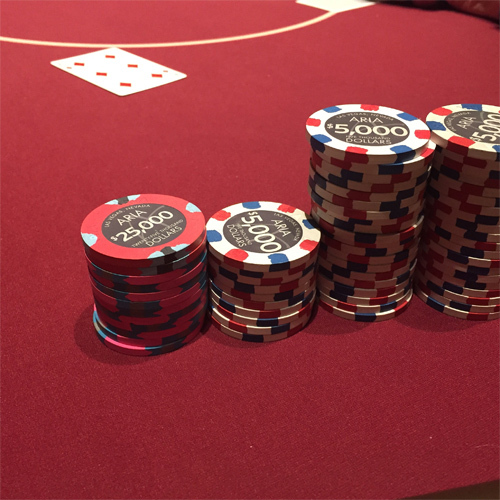 It seemed like a good card to bluff at, so I fired out $50,000. My opponent thought briefly before raising to $130,000. Obviously I was dead so I threw away my hand. The big blind showed his hand, he had KKK3 with no flush draw! He used the valuable information he had in having three of the four kings to take a chance that A) I didn't have the fourth King, and B) that I would be forced to fold if I had the 9-10. It was a genius bluff on his part, despite the fact that he had me beat anyway! I played exactly 6 hours which I planned to do even before I sat down and ended up with a $134,100 profit on the night. 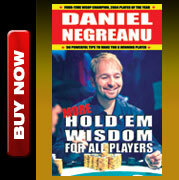 -Changing up the mix of games is essential to poker's future and growth. As games like no limit hold'em near closer to being solved, we need to always be innovative and think of new game formats that are both fun and interesting. -There was NO TANKING in this game! The players were invited to play, and if you are one of those players who takes an inappropriate amount of time, you will not be invited to play. I asked a couple of the people in the game why they don't play in the high stakes tournaments and they were crystal clear in their response, "The pace of play is too slow." They weren't talking only about the two most guilty players on that circuit today, Byron Kaverman and Christoph Vooselang, but the group as a whole. Players who take too much time to make decisions on a habitual basis are destructive to the tournament. If everyone took as much time as those two, for example, these events simply wouldn't happen. Nobody wants to play in a tournament where you are dealt less than 15 hands an hour. If everyone played as slow as those two, it would be impossible to play more than 15-20 hands an hour. -the way in which games happen has changed from the days when I was a grinder. Back then, if there was a seat open and you had the buy in, you could sit down and play. Last night there were three high stakes games going at both Aria and Bellagio and each of them were essentially based on invite only. It isn't legal to have "private games" in Las Vegas, but they have found a clever way around that. There is a set time that the games start and the players all show up at that time and fill the seats as well as the waiting list. 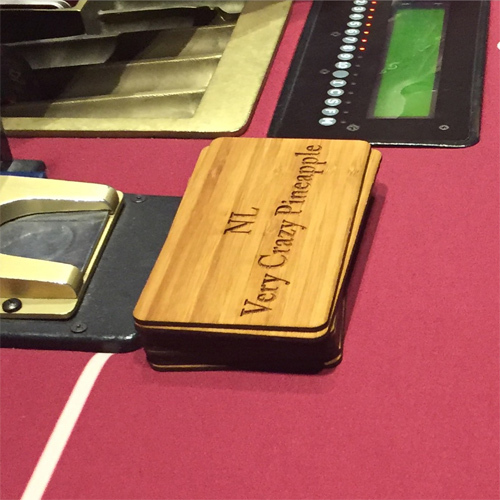 If you are a "nit" or play excessively slow, you won't ever get a seat in these games. I have absolutely no problem with the politics involved in this. I think it works out the way it's supposed to. If amateurs don't want pros in their games, they can shut them out by starting a full game with no seats available. With it being Super Bowl weekend action in Vegas is heating up so I will likely play at least one or two more sessions and let you all know how it goes.